I've moved my podcast site over to ASP.NET Core 2.1 over the last few months. You might want to follow the saga by checking out some of the recent blog posts. That's just a few of the posts. Be sure to check out the last several months' posts in the calendar view. Anyway, I've been trying lots of new open source tools and libraries like coverlet for .NET Core Code Coverage, and frankly, keeping my project files and dependencies up to date has sucked. Npm has "npm outdated" and paket has "paket outdated," why doesn't dotnet Core have this also? Certainly at a macro level there's more things to consider as NuGet would need to find the outdated packages for UWP, C++, and a lot of other project types as well. However if we just focus on .NET Core as an initial/primary use case, Jerrie Pelser has "dotnet outdated" for us and it's fantastic! At this point I'll run "dotnet outdated" on my podcast website. While that's running, let me just point you to https://github.com/jerriep/dotnet-outdated as a lovely example of how to release a tool (no matter how big or small) on GitHub. It has an AppVeyor CI link along with a badge showing you that it's passing its build and test suite. Nice. It includes both a NuGet link to the released package AND a myGet link and badge to the dailies. It's got clear installation and clear usage details. Bonus points of screenshots. While not accessible to all, I admit personally that I'm more likely to feel that a project is well-maintained if there are clear screenshots that tell me "what am I gonna get with this tool?" Here's the initial output on my Site and Tests. After updating the patch versions, here's the output, this time as text. 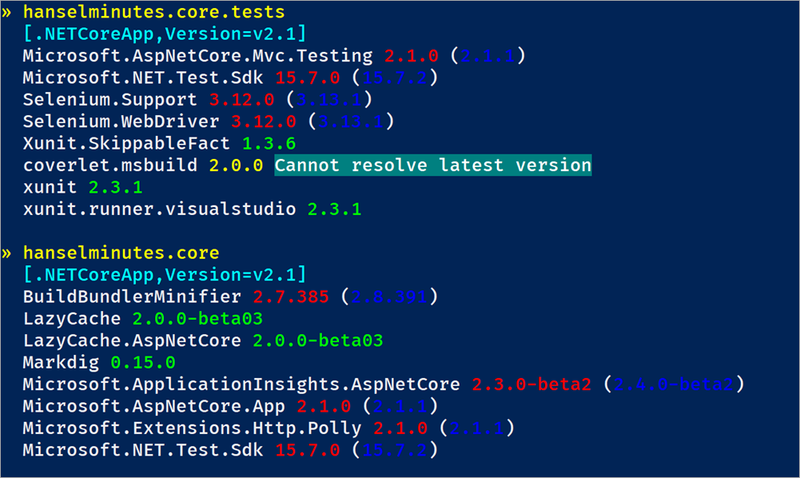 For some reason it's not seeing Coverlet's NuGet so I'm getting a "Cannot resolve latest version" error but I haven't debugged that yet. As with all projects and references, while things aren't *supposed* to break when you update a Major.Minor.Patch/Revision.build...things sometimes do. You should check your references and their associated websites and release notes to confirm that you know what's changed and you know what changes you're bringing in. Shayne blogged about dotnet out-dated and points out the -vl (version lock) options that allows you to locking on Major or Minor versions. No need to take things you aren't ready to take. All in all, a super useful tool that you should install TODAY. The source is up at https://github.com/jerriep/dotnet-outdated if you want to leave issues or get involved. Sponsor: Check out dotMemory Unit, a free unit testing framework for fighting all kinds of memory issues in your code. Extend your unit testing with the functionality of a memory profiler! Great post. Related to this is a global tool called NuKeeper, which was inspired by Greenkeeper. This is great. I may never open VS again. Wonderful! Just analyzed my .NET Core 2.1.0 project and realized every package I had was out of date. Oops. Thank you for this tip, Scott! What a useful tool. Much thanks. We update packages at the beginning of a long development cycle to avoid breaking changes in the middle or end of a release cycle. Selective updates are done on a package by package basis only if bugs affect our current release. Project stability is cost effective instead of churning each new GitHub package version. Can this tell us if globally-installed dotnet tools are outdated also? I'm now not sure thе place you are gеtting your info, but great topic. understanding more. Thank you for excellent info I waѕ on the lookout for this informati᧐n for my mission.